After driving from California to Maine from June 1 to June 24, it took me 11 more days to venture out to Peak's Island, where I'm going to live starting in late August. All the tourists are going to leave and it'll be me and about 1,000 other hard-core Peaks Island residents, just minding our personal and collective businesses for the fall, winter, and spring. I guess it's taken me a week and a half just to catch up with myself after almost a month on the road. I've re-acquainted myself with my mom, my dad, my sister, and my brother-in-law, all of whom have lived in or near Portland for 15 years. My nephews are now tall, funny, and kind. Their dog Max, a German shepherd-black lab mix, is truly a "very, very good boy, SUCH a good boy." When you go to their house, he brings his soggy tennis ball and a "stuffie" for you to admire (not, he politely infers, to play with). My parents' home in the woods outside Portland is lovely, spacious, and quiet. I seem to have brought a wave of summer heat and humidity with me from the Left Coast. People around here are practically panting, tempers flare in traffic (yes, there's traffic--the whole state of Maine does not consist of Arcadia National Park, people) and occasional thunderstorms bring folks out of offices and onto front porches to savor the brief coolness and reminisce about bygone, mellower meteorological times. So, having last week emptied the Mini Cooper of all my worldly belongings and detailed him back to a fine California sheen, I felt ready to explore my new surroundings. Going out to Peaks requires a 15-minute ferry ride, which I find both delightful and intriguing. I'm going to love living someplace that makes people work kind of hard to get to it. I mean, you have to want to go out there, specifically. 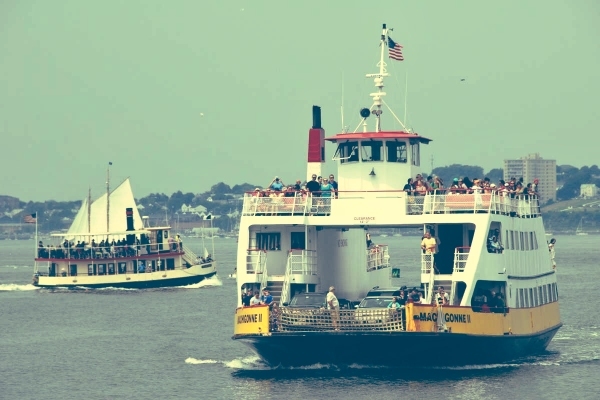 You buy a ticket for yourself and your bike or car; you wait until the next Casco Bay Lines ferry comes in; you get on board with everyone else and scramble up three flights of metal stairs to the top deck (of course); and then disembark on the beautiful island on the other side of Portland Harbor. The boat lets you out at the bottom of town, from whence tourists and locals alike disperse--the former to the golf cart and bike rental and ice cream shops, the latter to their summer or year-round homes, hauling carts of groceries and household provisions up the steep main street. I understand some folks shop in Portland and then have their purchases delivered on the ferry. A young man with a bicycle who works for Maine Medical Center told me, "Yup, they'll bring whatevah you want straight to your house. Costs a little extra, 'course." Me on my first ferry ride to Peak's. During my first crossing, in which I felt like the craft's imaginary figurehead in my eagerness to see Peaks, I fell into conversation with the man next to me. I suppose he noticed my wide grin, and asked, "Is this your first time out to Peaks?" I said indeed it was, and added (again with the eagerness), "I just drove all the way here from California to live on Peaks Island. I gave away all my stuff that wouldn't fit in my Mini Cooper and now here I am!" He immediately turned to his family and anyone within earshot, saying, "Hey, this gal just drove across the country to live on Peaks!" Now, I'd heard southern Mainers are friendly people, but my fellow travelers' response to this news floored me. "Oh, wow, good for you! I did the same thing 30 years ago and it's the best decision I ever made!" called one woman a few rows back. "No way," said another. "Man, are you brave!" There were several thumbs up and big smiles and congratulations from other people up front. After a bracing, scenic ride during which my newly long hair whipped wildly about, the ferry pulled into its berth in the harbor (or, as we say here, "hah-bah"). First the cars and trucks drive off, and then the people walk down the steps and out through the same giant passageway, over a temporary bridge, and out into the town. It felt a little like the scene from Close Encounters of the Third Kind when the humans and aliens exchange places at the end. Dazed from the bright sea and the roaring wind, we wandered slowly away from the boat to pursue our separate missions. I wonder if the locals see the (literally) boatloads of summer tourists disgorged from the ferry every hour as some sort of alternate species with which they have a symbiotic but not necessarily warm-and-fuzzy relationship? I wonder how I'll feel about this odd phenomenon when I officially achieve not-a-tourist status starting in late August? In any event, I didn't have much time to spend on the island, having found myself a rare open parking spot in Portland without factoring in the ferry times. (Note to my new island-dweller self: Factor in ferry transit times!) I stood in line for a bit with a dozen other tourists to rent a golf cart to take a quick tour of the 4-mile island perimeter, but gave up when I overheard the wait time was exactly when I should de-hock the Mini back across the harbor. I walked up the street and stood in line again to rent a bike for 30 minutes instead, but wandered off when the gruff proprietor ate up half of my remaining touring time paying minute attention to the customers in front of me. Finally, as a new blister gnawed at my left foot with each step and sweat trickled down my back in the humid heat, I decided to return to the ferry dock to wait for the next boat at 6pm. It was a lively scene now, with kids jumping from the pilings around the platform, arms and legs hugged tight to their bodies like Navy Seals plunging from helicopters. Signs said in big, red letters: "NO DIVING FROM PIERS OR PILINGS." A sizable crowd of adults, mainly parents, had gathered to watch and cheer the kids on. A friendly but daring competition was under way among some teenage boys, while smaller fry hurled themselves off a nearby dock on the marina side of the wharf. A large man with a baseball cap stalked out onto the wharf and announced that none of this was OK, saying in a stern voice, "Y'all know Old Man Riley's gonna call the cops any second, like he does every summer!" Most of the adults ignored him, but some gathered around, including some of the older teens, and listened while he said his piece. I couldn't hear the conversation that ensued, but soon the small knot of people dispersed, the large man left, apparently appeased, and everyone went back to their diving and jumping. There was surprising order among the kids, and they all seemed to look out for each other. No one paid me any attention, and I contentedly wandered around the wharf taking a few photos and enjoying being at the seaside. Thunderheads built in the distance. 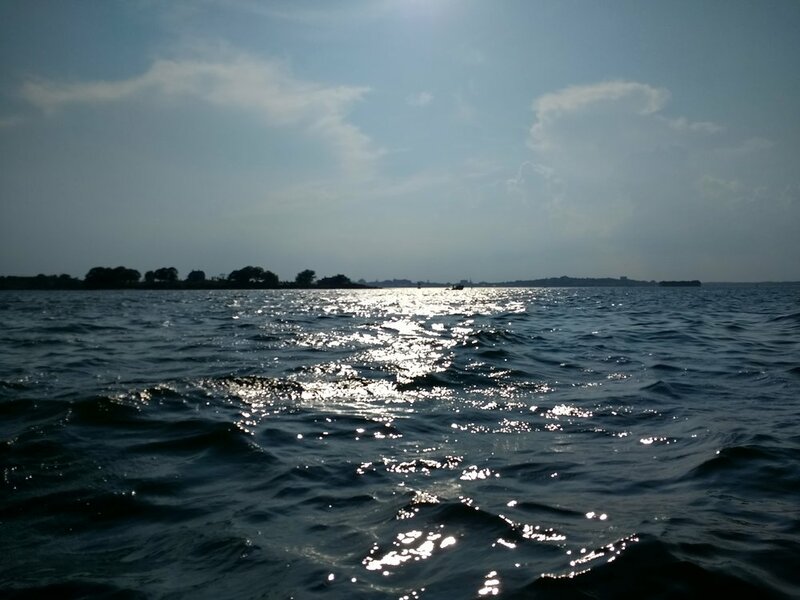 Near 6:00, I found myself down at the very bottom of the boat ramp, suddenly craving the feeling of the Atlantic on my hot, bare feet. Kids swam around me, expertly swinging on a rope placed, I think, to change deck levels and leave the water. Or else some mariner had just left it tied there. There were no accommodations for swimmers, like stairs or benches, anywhere. The boat ramp, for instance, plunges right into deep sea water at high tide, and getting out at that point requires some strategy and experience, if not outright hauling from a strong friend. Soon the ferry hove into view, and everyone immediately got out of the water and bundled up in towels. As we gathered to board the boat, I heard one boy say to a friend, "Oh, man, I'm so glad the ferry's here! I'm, like, so cold, like, I can't even function anymore!" The crowd of 50 or so folks returning to the city waited patiently as the cars and then the ferry passengers from the mainland disembarked, and then it was our turn to get on. A young man took a photo of his friends, both wearing brand-new faux captain's hats with gold braid trim. Although their caps remained crisp, the man and woman looked a bit worse for wear and somewhat wilted, having perhaps spent the hot afternoon at one of the island's wonderful pubs. Their friend laughed, poked a fist into the air, and announcing to no one in particular, "They came as tourists, and now emerge as captains!" The ride back across the harbor was just as wonderful as it had been on the way out. I noticed, however, on my way up to the top deck, many serious-looking people took seats indoors on the bottom deck. They seemed grumpy and impatient, or maybe didn't want their hair mussed in the fresh ocean air. I can't imagine this sea-crossing will ever become boring to me, and I hope I never end up as one of those serious people. I mean, come winter I might be forced to shelter inside, but I think I'll always be excited to be on the ferry. After all, I drove across our whole country to do this.